In all enclosed (fenced-in) game reserves, animal numbers (both predator and prey species) need to be carefully managed because they exist in closed environments. It is essential that the delicate balance between predator and prey be carefully maintained. Furthermore, these ecosystem components cannot exist if the basic building block, i.e. their habitat, is in an unhealthy or compromised state. For the past two decades, the Reserve Management has been actively involved with independent researchers to gain further understanding on the challenges of managing predators in a multi-guild system. Extensive research has been conducted on the resident lion, cheetah and leopard populations. These studies have been instrumental in enhancing our understanding of multi-pride (lion) systems, as well as contributing to national and provincial legislation to assist in devising sustainable leopard management policies. On-going research will contribute towards the first Species Action Plan for lions in South Africa which is currently under development. Research collaborations between the Greater Makalali Private Game Reserve and the Tshwane University of Technology, Panthera, University of Kwa-Zulu Natal, ALERT (African Lion & Environmental Research Trust), Charles Stuart University, the Lion Management Forum, Rhodes University and the University of Minnesota, have produced a number of peer-reviewed publications and a number of papers are in preparation. The Greater Makalali Private Game Reserve is involved in a collaborative project with the Department of Nature Conservation at Tshwane University of Technology being carried out by doctoral student Susan Miller, under the supervision of Dr Paul Funston. Susan is examining the pride dynamics and genetic status of isolated lion populations across South Africa with the goal of improving their conservation value through the development of a national management plan for all lions in South Africa (see below for details). In keeping with their keen interest in lion management issues, The Greater Makalali Private Game Reserve is supporting this project by providing historical data on their lion population as well as DNA samples from their current lions. The African lion (Panthera leo) is listed as Vulnerable on the IUCN Red List of Threatened Species (Bauer et al., 2008). In South Africa lions were extirpated from much of their historical range by the 1900’s (Nowell & Jackson, 1996). However, lions have been reintroduced into reserves in South Africa since the early 1990s (reviews Funston, 2008; Slotow & Hunter, 2009). While most of these lion reintroductions have been successful on the reserve level, they are for the most part micromanaged (Hayward et al., 2007; Hunter et al., 2007), showing tendencies towards inbreeding (Trinkel et al. 2010), and are thus of questionable conservation value (Slotow & Hunter, 2009). It has, therefore, been suggested that conservation areas in South Africa need to move away from micromanagement of lions towards a managed population network approach (Funston, 2008; Slotow & Hunter, 2009; Hayward & Kerley, 2009). It has been recognised that conservation ethics are not enough to drive the management of a species on private conservation areas where animals must contribute to the economy and thus, to ensure their survival, lions need to become drivers of socio-economic-ecological systems rather than a “threatened species”. Therefore, and any management recommendations must, realistically, take into account the economic value of lions while trying to ensure their biological survival though sound ecologically-based practices (Mokola LiMF workshop discussions, 2010). With the encroachment of humans into wild animal habitats and the resulting isolation of small populations, natural movement and mixing has been hampered and often completely eliminated leading to increased inbreeding, genetic drift, local extinction and risk of extinction of whole species (Hayward & Kerley, 2009). Human intervention can be used to mimic natural movement between isolated populations thus reducing genetic consequences as is being done for the wild dog (Lycaon pictus) in South Africa (reviewed Gusset et al., 2008; Davies-Mostert et al., 2009). This project aims to explore several aspects required for the successful design of a population network for lions in South Africa. Specifically we aim to examine how management decisions affect pride structure on conservation areas; determine the genetic integrity of these populations; and examine the economics of conserving lions in small protected areas as part of a conservation network. Ultimately we aim to determine the model that best fits and addresses the failings of the current setup and predict its effect if applied to the current population. All of this information will aid in the development of a National Lion Management Plan that has been instigated by the recently formed Lion Management Forum (LiMF) and will later be proposed to the Department of Environmental Affairs (DEA). The lion study is a large-scale research project that proposes to generate a document to facilitate and enhance the management of lions in small reserves. This project has two stages. The University of Natal has completed the first stage using historical records from Kruger Park, Umfolozi Game Reserve, and the Serengeti to map the influence of habitat (vegetation, topography), herbivore distribution and rainfall on lion group sizes, compositions, and reproductive rates. The data were used to predict how lions should behave and reproduce in any small area for which the environmental characteristics are known. The second stage of the project is to test these predictions in a range of small reserves as they introduce lions. This will validate the model that we are using, and any deviations from the model will allow us to reassess the parameters. A final, revised predictive model will be generated that will allow the manager of a small reserve to understand the impact of introducing lions to that reserve. Ross Kettles, Warden of the Greater Makalali Private Game Reserve completed his Masters Degree in Protected Area Management. Ross completed his thesis on Managing lions within small reserves. 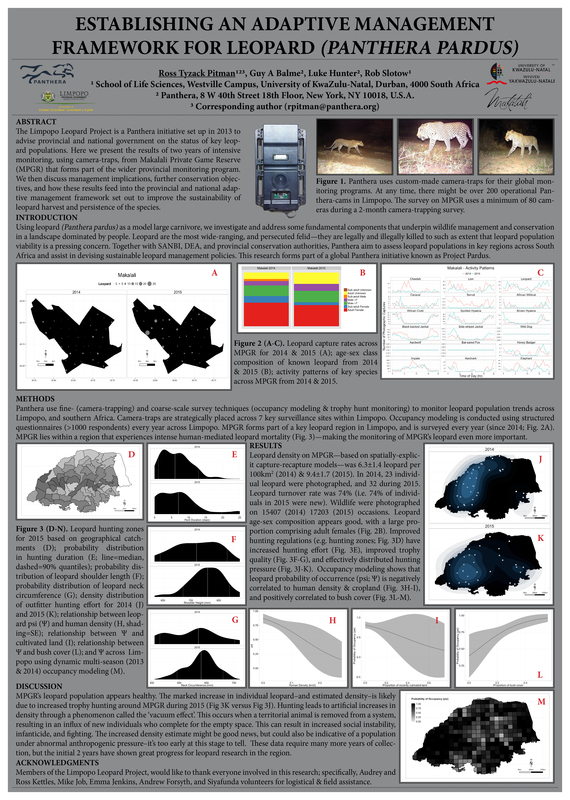 For the full paper, refer to the South African Journal of Wildlife Management, April 2009. Contraception has become a useful tool in population management of wild carnivores in zoos, wildlife sanctuaries and smaller conservancies. The choice of reversible or irreversible methods depends on requirements. The main reason for carnivore contraception in southern Africa is to slow down the rate of breeding rather than permanent sterilization or culling. In South Africa, lions are kept on a number of smaller game reserves (1,000-10,000 ha) where they are allowed to range freely with prey species. Under such conditions, the lack of competition from other lions and large predators results in an increased cub survival rate. The resulting population explosion leads to depletion of prey species, which are expensive to replace. To solve the problem, the rate of reproduction should be slowed down and, for genetic reasons; lionesses should be allowed to breed on a rotational basis. The Greater Makalali Private Game Reserve has adopted lion contraception, which consists of a hormonal implant, as part of their lion management regime. This forms part of a broad scale monitoring program conducted by the University of Pretoria’s Wildlife Veterinary Unit.